This morning, the US Senate defeated the Cybersecurity Act of 2012, a bill that would have given companies new rights to monitor our private communications and pass that data to the government. The bill sponsors were 8 votes short of the 60 votes necessary to end debate on the bill (vote breakdown here). This is a victory for Internet freedom advocates everywhere. Hundreds of thousands of individuals emailed, tweeted, called, and sent Facebook messages to Senators asking them to defend privacy in the cybersecurity debate. Those voices were heard loud and clear in the halls of Congress today. EFF extends our heartfelt thanks to everyone who fought with us on this issue. 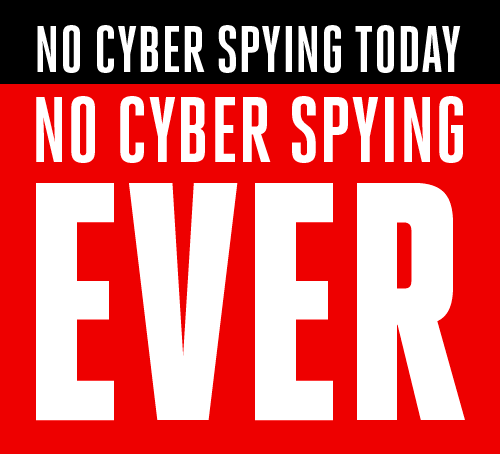 We can all be proud today that there was no law enacted on our watch that would have compromised the online privacy rights of Internet users in the name of cybersecurity. Pressure from civil liberties groups and Internet users didn’t just defeat the bill – it changed the conversation around cybersecurity in fundamental ways. Working together, we convinced the bill sponsors to put privacy protections into the final version of the Cybersecurity Act, which made it superior to any of the other cybersecurity bills being considered by Congress. While the bill still had big problems, there were new privacy protections such as limitations that prevented data collected for cybersecurity purposes from being used to prosecute unrelated crimes. Those privacy protections were created as a direct result of pressure from the netroots. Today’s vote was one in which Senators were asked to sacrifice Internet users’ privacy and civil liberties for weak proposals to improve cyber security; I voted no. And Senators Al Franken and Rand Paul sponsored an amendment that would have removed the most privacy-invasive provisions of the bill. These champions of online rights helped us in the cybersecurity fight – and will hopefully stand with us again in defending civil liberties the next time this issue arises. Today, we celebrate. But threats are on the horizon. Congress has been working to pass cybersecurity legislation for years – and for years, EFF has fought to ensure that civil liberties weren’t sacrificed in the process. This year was the hardest fight of all: Congress got closer than ever to enacting a cybersecurity bill that could threaten the privacy of our online communications. We fought back with everything we had and defeated the bill, but they’ll be back – either this fall or next year. It is the commitment and passion of EFF members that is necessary to defending against this type of anti-freedom legislation. Without those voices, we would never have beaten back SOPA, HR 1981, or the Cybersecurity Act. Thank you for making this possible. EFF is committed to defending our online freedoms against all threats, and the majority of our funding comes from individuals making small donations. If you believe in the work we’re doing to safeguard liberty in the digital age, please make a donation or become a member. We’ll use your financial support to advocate for users, innovation, and civil liberties. And when rights are next threatened, we’ll let you know. Sign up to get email updates from EFF. And you can also stay in touch through Twitter, Facebook, Google Plus, and identi.ca. We’ve built a coalition of advocacy groups from all sides of the political spectrum willing to do what it takes to defend our online rights. Many of them are partners who worked with us to defeat SOPA. We’re thankful to groups and companies like American Civil Liberties Union, American Library Association, Center for Democracy and Technology, Competitive Enterprise Institute, Demand Progress, Fight for the Future, Free Press, Liberty Coalition, Mozilla, Reporters without Borders, TechFreedom, Techdirt and many, many others. We know that whenever fundamental freedoms are threatened, they will dive once more unto the breach to fight fearlessly for what’s best for Internet freedom. Thank you!